Bandai‘s Wonderswan was an handheld system released exclusively in Japan in 1999. This console was especially sought after because around December 1999 Bandai struck a deal with Squaresoft to bring their games to the console. The first projects announced were the remake of the first three Final Fantasy, a chocobo game, Romancing SaGa and a port of Seiken Densetsu 2 (known as Secret of Mana in the west). However not all of these games would seen a release at retail as Seiken Densetsu 2 was never seen again. 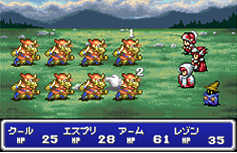 Final Fantasy III shared the same destiny although it was shown on the official Squaresoft site: Final Fantasy III Wonderswan archieved site. This cancellation was especially notable because the Final Fantasy remakes , which were bundled with the system, were the biggest sellers on Wonderswan Color. Later, after a brief rumor on a possible remake on PlayStation 2, Final Fantasy 3 was unveiled as new 3D remake for Nintendo DS that eventually sold around 2 million units worldwide. This 3D remake, very different from the 2D remake proposed for Wonderswan, would be made available on PSP, iOS and Android years after the original DS release. 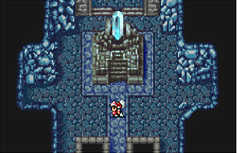 When we developed FF3, the volume of content in the game was so huge that the cartridge was completely full, and when new platforms emerged, there simply wasn’t enough storage space available for an update of FF3, because that would have required new graphics, music and other content. There was also a difficulty with how much manpower it would take to remake all of that content. The strange thing is that Final Fantasy I and II remakes and Final Fantasy IV were all deployed on a 4MB cartridge and Wonderswan theoretical biggest cartridge size was 16MB in fact a few games (even Squaresoft own Front Mission) were stored on 8MB cartridge, with Konami’s Beatmania being the only game weighting 16MB so storage space limitation is unlikely to be the main culprit. It’s very likely that the shaking Wonderswan market in 2001/2002 (the system was discontinued by Bandai in 2003) along with the costs in developing a 2D remake sealed the fate of this project.